"This recipe was given to me years ago. 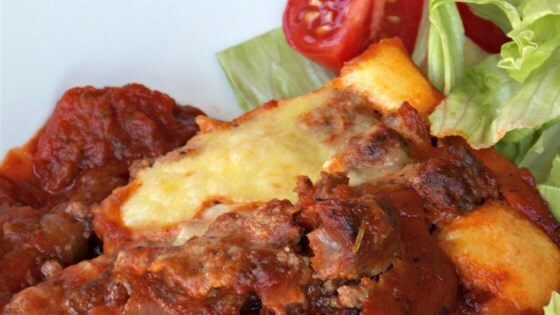 This casserole freezes well, so when eggplants are in the garden you may use them up." Heat a few tablespoons of olive oil in a large skillet over medium-high heat. Fry eggplant slices in hot oil until browned thoroughly, 3 to 5 minutes per side. Add oil between batches as needed. Drain fried eggplant slices on paper towels and season with salt. Heat a large skillet over medium-high heat. Cook and stir beef in the hot skillet until browned and crumbly, 5 to 7 minutes. Add onion and garlic to the beef; cook and stir until onion is golden brown, about 5 minutes more. Pour spaghetti sauce over the ground beef; add oregano and stir. Simmer mixture until sauce is heated through, 5 to 7 minutes. Arrange about half the eggplant slices into the bottom of a shallow casserole dish to cover completely. Ladle about half the beef sauce over the eggplant. Sprinkle 1/4 cup Parmesan cheese over the sauce. Repeat layers. Beat egg with 2 tablespoons Parmesan cheese; pour over the top of the casserole. Bake in preheated oven until bubbling around the edges and hot in the center, 20 to 25 minutes. I kind of used the recipe and winged it a bit as well. That being said it was delicious! Next time I'll use more eggplant . Better than I expected. Pretty simple to make too!